In recent Apprising Ministries articles like T.D. Jakes Repents Of Word Faith Heresy And Mythology? and T.D. Jakes Prsents Word Faith Leadership Conference I covered a very critical issue concerning the move to make a mainstream evangelical out of “trinitarian-modalist” and Word Faith prosperity preacher T.D. Jakes. Yes it does, to say the very least. It’s to the shame of evangelical leaders that something like the following even needs to be explained. However, in this time of spiritually prissy postmodernism way too many people are afraid to make anything close to a stand for proper biblical doctrine. It’s not wrong to criticize someone’s false teaching. What I’m about to show you from T.D. Jakes is evidence of the fruit of his teaching, by which Jesus says we will recognize whether or not he is a teacher of false doctrine. You’re about to see, again, that Jakes’ involvement with notorious WF preacher Pastrix Paula White goes far beyond being merely associated with this charlatan. 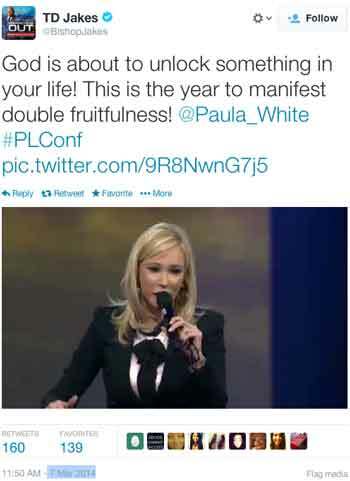 You need to know that years ago Jakes helped launch the WF ministry of Pastrix Paula White. She wasn’t one of the scheduled speakers at this year’s IPLC, though she has been previously.2 Even so, it seems T.D. Jakes is quoting something White shared from the platform of IPLC while she was addressing this year’s gathering. Those of us familiar with WF language recognize it’s the typical jargon preached at virtually every event. A type of spiritual lottery where one hopes that God is about to “unlock” your numbers so you’ll receive your winnings aka “breakthrough” as a manifestation of a “double portion” of whatever you’re aiming for; health, wealth, etc. As I previously pointed out e.g. in Elephant in the Room: T.D. Jakes and Paula White, a gigantic elephant in the room concerning Jakes is his close relationship with Paula White. 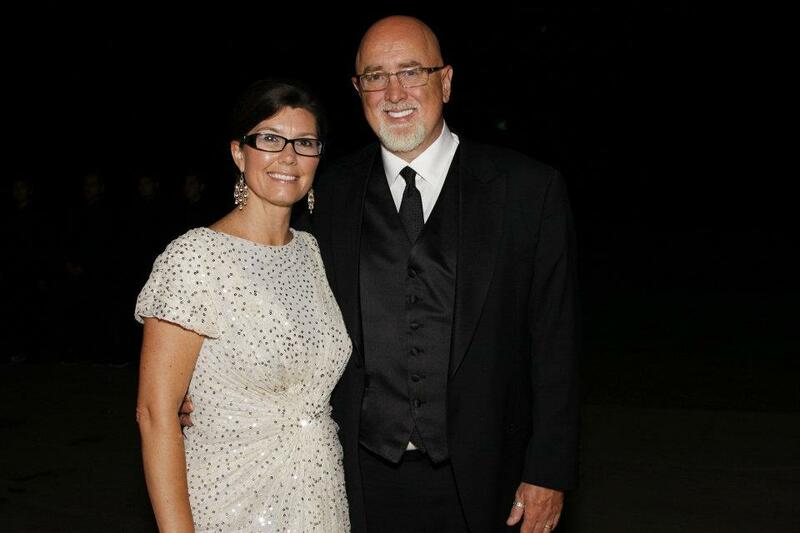 I told you above that he helped launch her upon the Christian community. Well, White has mentioned this fact so many times that it’s easily proven. In fact, as you’ll see below, T.D. Jakes hosted TBN’s Praise the Lord program back on 9/1/11, which featured White, Pastrix Cindy Trimm and Pastrix Sheryl Brady, whom Jakes personally installed as pastrix of his Potter’s House North Dallas. They were promoting Jakes’ Woman Thou Art Loosed 2011 apostasia-palooza. You’ll hear that T.D. Jakes introduces Paula White as “this tremendous woman of God” whom he actually calls “pastor extraordinaire.” Quite obviously, Jakes has no problem advancing as elders women who’re in rebellion against God’s Word. This will also be a coming wave of the future within evangelicalism. You might recall from Louie Giglio, Passion 2013,and Jesus Culture that JC and Walker-Smith come from the theological train wreck happening at Bethel Church (BC). Let me also take the time to remind you that BC is headed up by über hyper-charismatic and New Apostolic Reformation (NAR) spiritual wingnut Bill Johnson. Since T.D. Jakes and his spiritual progeny Pastrix Paula White are the focus of this piece, Lord willing, another time we’ll look further into Johnson, Jesus Culture, and Walker-Smith. Here I’ll simply refer you to Friends of Bethel Church, Home of Jesus Culture; an article I wrote concerning this movement a couple of years ago. For now, it’s important to note that Satan is after your youth and he’s the one uniting these youth movements like JC, Louis Giglio’s Passion 268 Generation and IHOP.6 And so, it appears the enemy is now going to be making inroads into the Word Faith movement as well in order to make all the younger sectors of charismatics into one. Do you think it’s merely a coincidence that over the past couple of years these same names keep popping up together like interlocking circles? If so, I exhort you to think again as this is fruit of all this hyper-charismaticism and Contemplative Spirituality/Mysticism, which serves to bring together these who are playing the spiritual fool.